BERLIN, GERMANY--(Marketwired - July 12, 2016) - Rail technology leader Bombardier Transportation and Ukrainian Railways (Ukrzaliznytsia) have signed a Memorandum of Understanding (MoU) to explore the creation of joint industrial activities in Ukraine. Both parties agree to work closely together to define the best possible way to rapidly and cost-efficiently upgrade Ukrainian Railways' locomotive fleet. 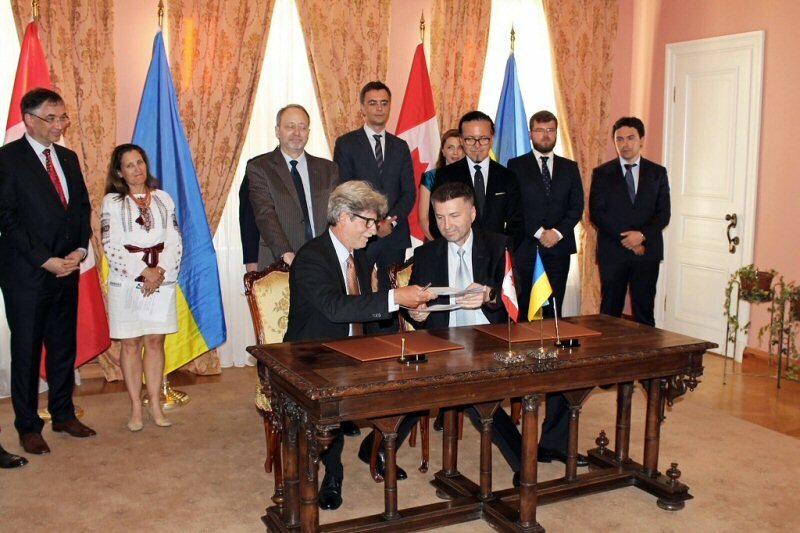 The agreement was signed in Kyiv on July 11, 2016 by Wojciech Balczun, Head of the Board, JSC Ukrainian Railways and Erwin Gerber, Head of Locomotives Business Unit, Bombardier Transportation, in the presence of Volodymyr Groysman, Prime Minister of Ukraine, Justin Trudeau Prime Minister of Canada, Volodymyr Omelyan, Minister of Infrastructure of Ukraine and Chrystia Freeland, Minister of International Trade of Canada. Volodymyr Omelyan, Minister of Infrastructure of Ukraine, commented, "We are considering the possibility of cooperating with Bombardier in the joint production of electric locomotives in Ukraine. The work has already begun with the negotiations. We have agreed to establish a corresponding working group that will determine the main technical and economic parameters of the new traction rolling stock fleet." Erwin Gerber, Head of Locomotives Business Unit, Bombardier Transportation, added, "Bombardier, as a global leader in rail technology, is very proud to have been chosen by Ukrainian Railways, the largest rail cargo operator in Europe, to play an important role in their impressive transformation program aimed at modernizing and replacing their locomotives fleet. We are very committed to contributing to the rapid and successful development of rail transport in Ukraine, which will enable deeper integration of the Ukrainian transportation network into the global transport system." Bombardier Transportation has been present in Ukraine since 2012 with its Rail Control Solutions site in Kharkiv which provides a full range of rail control services including design, turn-key signalling, telecommunications projects and maintenance services. The Kharkiv team has completed several signalling projects in Ukraine and has successfully delivered a BOMBARDIER EBI Lock 950 CBI interlocking system on the Krasnograd - Lozovaya Line ahead of the European Football Championships held in Ukraine in 2012. Bombardier, EBI and The Evolution of Mobility are trademarks of Bombardier Inc. or its subsidiaries.